Versatility is something we’re all looking for when we’re shopping for clothes. And, like many of us, I’ll often ask myself how many ways I can wear a possible purchase before handing over the plastic. Can I wear it to work? Can I dress it down? Will it work with jeans? Or this weekend, given the forecast? It’s not just a matter of getting the most bang for our buck either. Everything we buy takes up valuable real estate in our wardrobes and as such, we should be making sure they earn their keep. 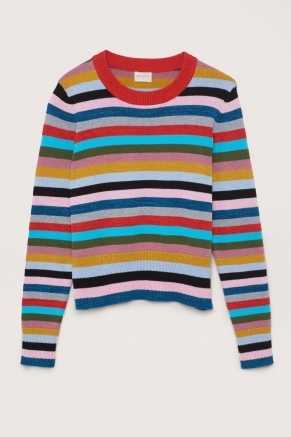 So when I spotted this I Can Sing a Rainbow Knit in Gorman recently, I had to stop and think. It was Fashion Love at First Sight. Definitely. It made me smile. The colours were fab. The lurex element made it capable of being dressed up. It was the fashion equivalent of Mardi Gras meets Ernie and Bert. But how much wear would I get out of it? I’d need to be able to work it several ways to justify the price tag too. With my predominantly casual to smart casual wardrobe, I had a good feeling that this piece would slot in perfectly. And so I set myself a challenge to style it three ways. 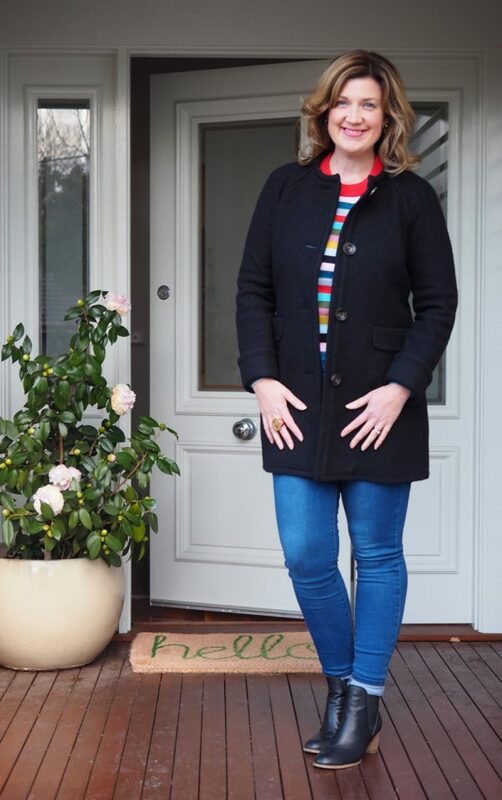 Above I’ve added my new Glassons jeans (which I’m loving and you can read more about here), a Boden wool coat from a couple of seasons ago, my Django and Juliette Sadore ankle boots in black leather from Style Tread and some gold accessories to pick up the gold in the knit. Oh and size wise, I’m wearing a size 12 in this knit as I wanted a neater fit to wear under dresses, with skirts and under coats. 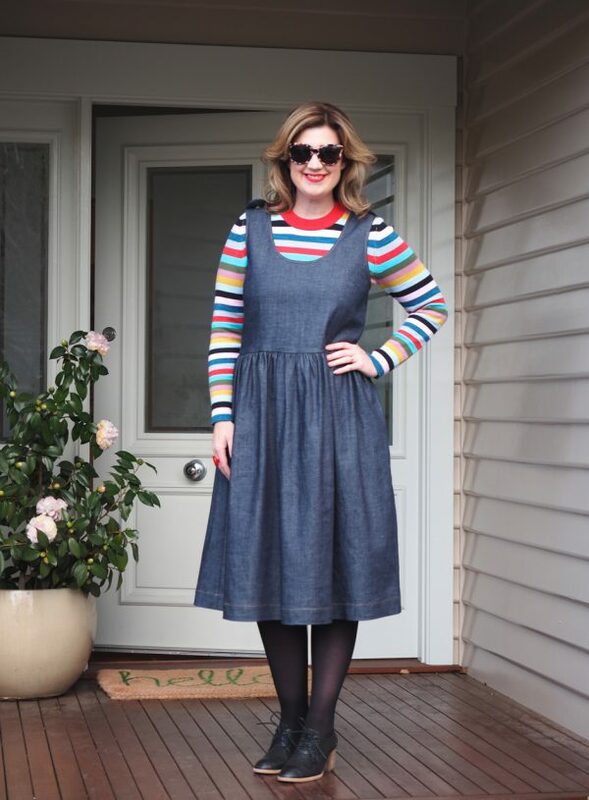 For this second outfit, I’ve gone for a playful but fun smart casual look with this current season Obus denim dress (The Boulevard Dress – I’m wearing size 2), Silent D lace ups from Style Tread, Dinosaur Designs ring and Gorman sunnies from a couple of summers ago. 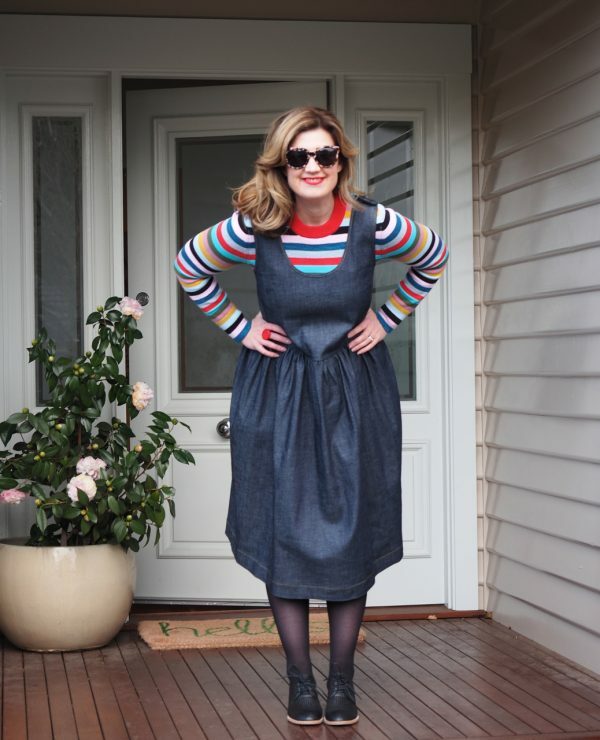 This dress reminds me of the pinafores I’ve always loved wearing although I’ll be replacing my previous skivvys with some merino rollnecks now its twenty sixteen (and on that note, how cool a word is skivvy?). 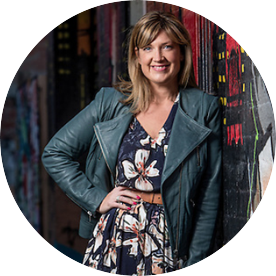 The denim is a reasonable weight too and perfect for trans-seasonal dressing in Melbourne. I’ve always wanted a denim dress like this that I can wear with fitted knits in winter and striped tees in the milder weather. This final outfit is a dressier take again. I’ve simply paired the knit with a black skater skirt picked up on sale recently from Boden, tights and my Sadore boots by Django & Juliette and added some complimentary bling with these Emily Green Terrazzo earrings in mint and peacock. I love a pattern clash at the best of times, but especially when stripes and metallic accents are involved. I’d also wear this knit with a pencil skirt and pointed heels or flats for the office. 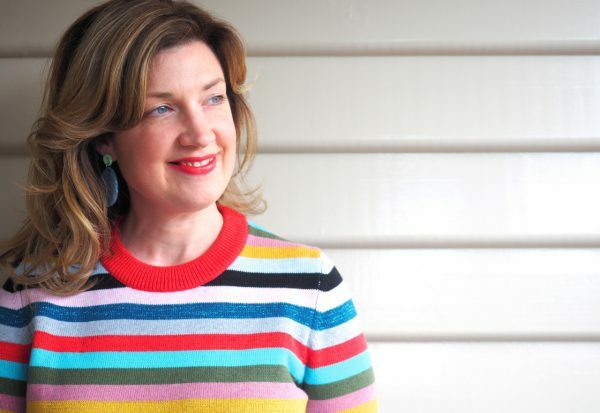 As I hope I’ve shown above, the beauty of a striped knit is that you’ve got at least two if not more colours to play with, so you can dress it down with denim or pick up one of the colours in your accessories, shoes or skirt/dress/pants/coat or even lipstick. There are so many possible variations, particularly when you’ve got a few colours to work with. This is what makes a striped knit so versatile for me. 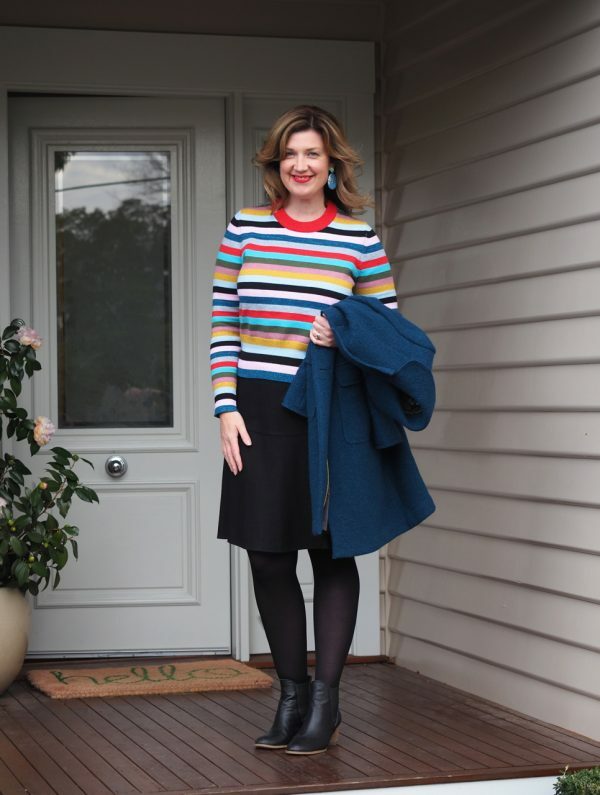 If you’re looking for some more budget friendly striped knits, check out the great selection at Dotti here. You’ll also find a rainbow of striped Bretons from Boden here. How would you style this knit? Is there a striped knit in your wardrobe?